How Long to Bake Brownies Using Molds? What Happens When You Forget to Put Eggs in the Brownie Batter? Adapting your brownies for high-altitude baking requires a bit of effort and experimentation. 3 How Long to Bake Brownies Using Molds? 4 What Happens When You Forget to Put Eggs in the Brownie Batter? Moving to a new city at a higher altitude presents a few challenges, from physical fatigue to reworking your favorite recipes. 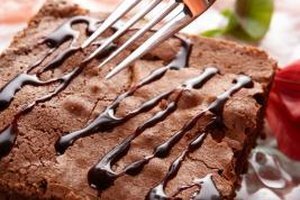 The lower air pressure and thin, dry air at higher elevations can do strange things to your baked goods, even relatively simple baked goods such as brownies. They're less prone to failure than rich, delicate cakes, but getting them to behave might require a few test batches. Chances are you'll need to alter both temperature and ingredients along the way. Contact your local county extension office, and find out exactly how high above sea level you are. Most recipes will work up to about 3,000 feet without alteration, but the higher you go, the more they'll need to be adjusted. Bake a test batch of your brownies without altering the recipe, and evaluate the results. Sometimes your original recipe is forgiving enough that it won't need to be changed. If it's dry, if the texture has changed or if your brownies rose and then fell, you'll need to try a few alterations. Bake your brownies at a slightly higher temperature, increasing the oven's heat by 15 to 25 degrees Fahrenheit. Shorten the baking time to compensate, leaving your brownies in the oven 8 minutes for every 10 minutes specified in the recipe. In many cases, hotter and faster baking will correct the brownies' texture adequately without further changes. Reduce the leavening if your brownies rise too much, or rise and then fall. Cut back your baking soda or baking powder by 1/8 to 1/4 teaspoon, and don't beat the fat and sugar as long. Baked goods rise quickly at high altitude, and will dry out if you use too much leavening. Increase the moisture in your recipe by adding extra milk or an additional egg yolk. Alternatively, use an extra-large egg instead of a large egg. The added liquid helps keep your brownies moist, and the extra egg will provide structure to the brownies' crumb. Chocolate-rich baked goods such as brownies can scorch or burn if you bake them at too high a temperature, so if you find that 25 degrees is too much of an increase, reduce the oven's heat after the first few minutes. Baked goods tend to stick more at high altitudes, so grease your pans well or line them with parchment paper to make the brownies easier to remove. If your brownies come out too dense, you might also need to reduce the fat and sugar in your recipe, but the opposite is more likely to be the case. Does High Altitude Make a Difference for Regular Cake Mix?